The Republic of Cameroon has been ruled by one man, Paul Biya, since November 1982. 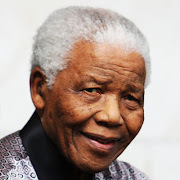 By virtue of the president's longivity at the helm alone- and the fact that in 2008 the 86-year-old eliminated presidential term limits from the Constitution of the Republic - Cameroon has been tagged a dictatorship by many analysts. But recent, more disturbing events, including the arrest and imprisonment of a political party leader and presidential election candidate and his supporters have added weight to the assertion that Cameroon is, in fact, a dictatorship. 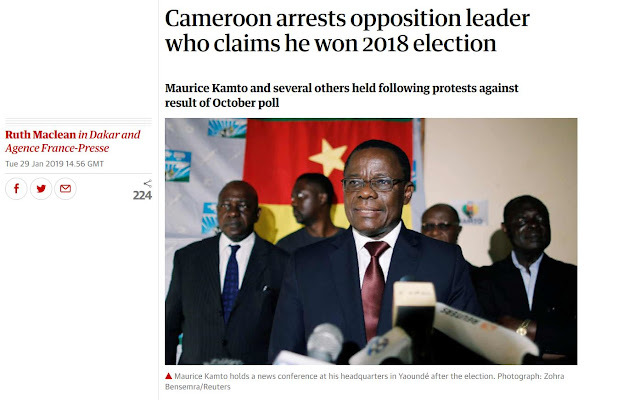 On January 28, 2019 Maurice Kamto, leader of the Cameroon Renaissance Movement - a party that contested the results of the 2018 presidential election, was arrested in Douala along other political activists, including one who was pulled out of his hospital bed where he was recovering from a gunshot wound sustained during a peaceful protest, according to The Guardian. Kamto was arrested after his opposition party organized several peaceful protests in towns across the country, including one in the economic capital Douala on January 26, 2019 during which police opened fire on protesters - wounding two prominent figures of the Cameroon Renaissance Movement, namely Michelle Ndoki and Celestin Djamen. Human rights group Amnesty International condemned the violent crackdown and called for the release of more than a hundred peaceful protesters arrested for exercising their right to peaceful protests. The rights group also expressed concern that Maurice Kamto and more that a hundred supporters face the death penalty as Cameroonian authorities intensify crackdown of critics. One month after the arrest of Kamto, Michele Ndoki, a lawyer and political activist of the Cameroon Renaissance Movement was arrested. Prior to her arrest, she was among those shot and wounded by police during a peaceful protest in Douala. She is one of the lawyers who argued before the Constitutional Council for the annulment of the 2018 presidential election. Amnesty International launched a petition calling for her release. According to the human rights group, she was arrested on February 25, 2019 while trying to cross the border to Nigeria. She faces charges of rebellion, hostility against the homeland, incitement of insurrection, offence against the president of the republic and destruction of public buildings and goods. She faces the death penalty, according to Amnesty International. Earlier this week, a popular Cameroonian musician popularly known as Longue Longue was reportedly arrested in Douala in relation to a video he posted on social media criticizing the government and results of the disputed 2018 presidential election. He was reportedly released later. Cameroon is a dictatorship. It has always been under 86-year-old president Paul Biya who has been in power for almost four decades -- but the arrest of opposition leader Maurice Kamto and his supporters on trumped up politically motivate charges solidifies Cameroon's place on the global list of dictatorships where authoritarian regimes crackdown of political dissent using riot police in the streets and judges in politicized courts, including military tribunals. Dictatorships can always claim elections were free and fair, especially when, in some cases, bogus international observers like those uncovered during the 2018 presidential elections in Cameroon endorse the results. But dictatorships cannot deny the arrest and persecution of opposition political party leaders, political activists and journalists before military courts. According to Amnesty International in its 2017/18 annual report, human rights defenders, including civil society activists, trade unionists and journalists in Cameroon "continued to be intimidated, harassed and threatened", and unfair trials continued before military courts, which are often "marred by irregularities". The report documents military court trials against journalists like Radio France Internationale correspondent Ahmed Abba. Cameroon has always been a dictatorship. A country where the Head of State has absolute control over all branches of government, including the judiciary which is routinely being used to silence political dissent with the help of a sweeping anti-terrorism law -- a law that severely restricts freedom of expression and freedom of the press, and has landed several journalists, political activists and peaceful protesters before military courts on trumped up charges. The mere fact that the Head of State, 86-year-old Paul Biya, Africa's oldest president who will be 92 when his new term ends, according to The Associated Press, recently won a seventh consecutive term in office - all disputed - after eliminating presidential term limits from the Constitution of the Republic in 2008 - points to a dictatorship but sometimes more evidence is needed to prove a case. Recent events in Cameroon over the past couple of months, including the arrest of political party leader Maurice Kamto and political activists of his party, Cameroon Renaissance Movement, have provided plenty of supporting evidence -- evidence that adds weight to the long-standing assertion that Cameroon under the Paul Biya regime is a dictatorship. For over two years Cameroon has been engulfed in a political impasse that has over time degenerated into a humanitarian and human rights crisis in the Northwest and Southwest regions of the country. Many people have been killed and thousands displaced internally and internationally, and there have been allegations of a genocide happening in the affected regions. While there is evidence of possible war crimes committed by the Cameroonian military operating in the Anglophone regions of the country, there is no concrete evidence of a genocide - in the true sense of the word - happening yet. However, there is a real possibility of a genocide in the future if the crisis is not addressed, but the impending genocide would not necessarily be committed by the military. The Bangourain attack, allegedly by an armed group from the English-speaking region, and the retaliatory attack against Anglophones in Bangourain that followed are a warning sign and a blueprint of what could spark a genocide. In 2016, lawyers in the English-speaking Northwest and Southwest regions of Cameroon went on strike - decrying what has been described as the "Francophonization" of the legal system in the regions by way of, for example, appointing French-speaking judges to courts in English-speaking regions. When their demands were not met they took to the streets in peaceful protest. The protest were met by tear-gas and a heavy-handed response by state security forces. Teachers, students and the general population joined the protests, and the situation morphed into a mass uprising against marginalization of English-speaking Cameroonians in a majority French-speaking country. The government's heavy-handed response continued and what started as a call for reform turned into calls for outright secession of the English-speaking regions. Armed groups emerged and the Anglophone regions of Cameroon became engulfed in outright armed conflict between separatist groups and state defense and security forces. Hundreds - if not thousands have been killed, schools and houses burnt down and hundreds of thousands of people displaced from their homes in Cameroon's Anglophone Northwest and Southwest regions. According to the United Nations Office for the Coordination of Humanitarian Affairs (OCHA), more than 437,000 people in the Northwest and Southwest have been displaced internally as of November 30, 2018. The socio-political situation in Cameroon remains tense, and there have been a proliferation of non-state armed groups. According to UN estimates, thousands of Cameroonians have fled to Nigeria. Over 20,000 Cameroonian refugees were registered in Nigeria as of March 2018. Civilians have been caught in the crossfire and "genocide" has been used to describe atrocities committed in the region, sometimes against whole villages. "This is a genocide", a woman reportedly told The Guardian. According to The New York Times, many have accused the Cameroonian military of "genocide". Forcibly transferring children of the group to another group." Drawing from the afore definition, genocide is a serious crime. It is not a word to be thrown around lightly else risks losing seriousness. That said, atrocities have been committed in the Northwest and Southwest regions of Cameroon, and the Cameroonian military has been linked, by credible sources and analysis, to the atrocities. These atrocities including extrajudicial killings and the burning down of civilians' houses and in some cases the razing down of whole villages. 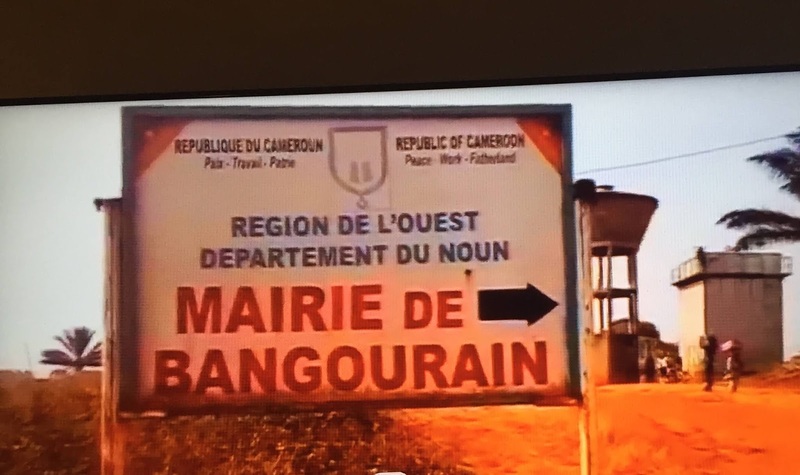 In June 2018, using satellite imagery and eye-witness testimonies, BBC Africa Eye linked Cameroon's state security forces with the burning of villages. Some of the atrocities committed by the military rise to the level of war crimes, but, in my view, fall short of genocide. The atrocities include burning down of villages and houses, destroying sources of livelihood in civilian areas, torturing and killing captured suspected separatists. War crimes have, without a doubt, been committed in the armed conflict in the Northwest and Southwest regions. These war crimes include the burning of schools, destruction of hospitals and health centres and kidnapping of civilians, including students and teachers by non-state armed groups. gunmen. One person was killed, about 80 houses burnt down and 15 people kidnapped. Members of the Bangourain community on their part retaliated three days later by publicly beating to death two Anglophones suspected of involvement in the Bangourain attack, and reportedly asked Anglophones to leave the area. The gruesome killing that could be aptly described as a public lynching was also captured on video and widely shared on Facebook. I am afraid we have not heard the last of Bangourain yet. Both sides, Anglophones and Francophones in Bangourain and in the rest of the country must exercise restraint in order to avoid an escalation that could lead to mass killings along linguistic lines or, yes - a genocide. The Bangourain tragedy is a warning sign and a blueprint of how a genocide could be sparked in the context of the Anglophone crisis. The genocide would not necessarily be committed by the military. It would be committed by civilians, when, for example, someday, for some reason, French-speaking Cameroonians turn against English-speaking civilians or vice versa. That is how the Rwandan genocide happened. Hutus turned against Tutsis. Africa was represented in the 2018 FIFA World Cup in Russia by five countries: Egypt, Morocco, Nigeria, Senegal and Tunisia. With the elimination of all African teams from the tournament in the group stages - the last to exit the big stage being Senegal - many Africans, either out of ridicule or genuine support - turned to France, and dubbed the European country's squad an "African team". Others referred to it as the "United Nation of France" or "Africa United" - due to the large number of players of African descent in the squad. Many claimed that there was still an "African team" in the tournament, despite the fact that no side from Africa made it to the knockout stages. France went on to win the World Cup, and the chatter surrounding the French side continued - with some claiming Africa won it for France. Africa, according to the BBC, suffered its worst World Cup display in 36 years, with no side from the African continent making it to the knockout stages for the first time since 1982. France went on to win the tournament, with nineteen of its 23 players being immigrants or children of immigrants, according to AJ+ on Twitter. According to an article posted on The Undefeated, twelve of the 23 French players are of African ancestry. The BBC puts the number at fifteen out of 23. Since all teams from the African continent exited the tournament the ethnic composition of the French national team has been making the rounds on social media. After the final, social media was awash with tweets and Facebook posts about the African ancestry of French players. One Twitter user, for example captured it all when he congratulated Africa for the victory. That was the general point of view of Africans online after the final whistle in Luzhniki stadium in Moscow on July 15, 2018. 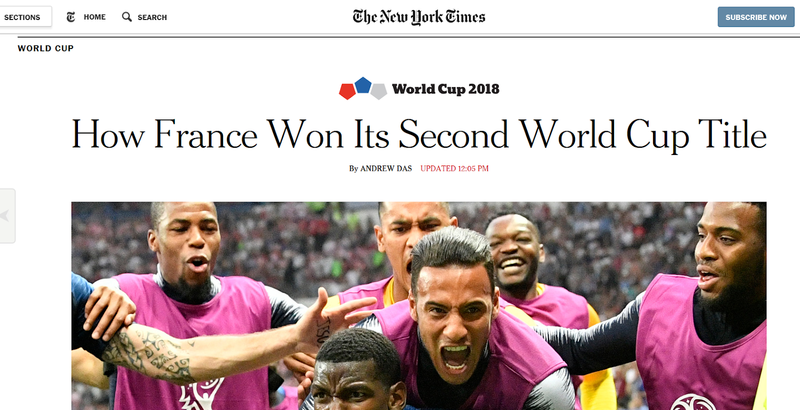 France, not Africa, won the 2018 FIFA World Cup. It is true that on account of personnel, the French national team is made up of Africans but it is, in fact, France's team. The French players - be it Samuel Umtiti whose parents are reported from my home country, Cameroon, or Adil Rami whose parents are reportedly from Morocco, or Paul Pogba whose parents reportedly hail from Guinea, or Blaise Matuidi whose parents hail from Angola and Congo, or N'Golo Kante whose parents reportedly hail from Mali - are French. They are French nationals, and France gave them the training and opportunity they need to play football at the highest level. They wore the French colors and represented France, not Africa - which by the way is not a country. The way I see it, France takes almost all, if not all, credit for winning the World Cup, and it would be disingenuous to argue otherwise. The only credit I give Africa is ancestry - and ancestry alone, I believe, cannot win tournaments. The French starting XI at the World Cup final was made up of many players of African descent: Kante, Pogba, Matudi, Mbappe and Umtiti. But Africa's contribution to their success in terms of football is almost non-existent. None of them has ever played professional or academy football in Africa. In fact, there is a strong case to be made that chances are, due to bad governance and corruption, including nepotism and lack of basic infrastructure many of the French star players, including 19-year-old Kylian Mbappe whose father reportedly hails from Cameroon and mother from Algeria would not have had an opportunity to reach their full potential had there been in Africa. As a Cameroonian, I am all too aware of how bad governance has ruined the nation, including sports. Mbappe who won the FIFA Young Player Award would, I reckon, probably not have made it into the Cameroonian national team due to nepotism. He might not even have had an opportunity to play football as a tot due to socio-economic limitations. And even if he beat the odds and made it into the team, corruption would have stunted his development in the trade. I would argue further that many Africans who recognize French players now would have probably not embraced them had they not won the World Cup, or if a team from the continent had gone further in the tournament. It would have been interesting to see the reaction if France came up against Nigeria, for example. The representation of the French Team as an "African team" is opportunistic and intended to divide and provoke France - a country many Africans see as responsible for the sorry-state of affairs on the African continent as a result of colonial and neocolonialism. It is also a somewhat racially divisive point to make -- as it pits people of African descent against the rest of France. 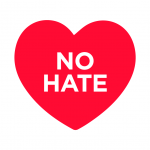 It plays right into the hands of racist far-right extremists who hold the view that immigrants or children of immigrants born and raised in France are not and can never be French. The players who won the World Cup are French. They recognize themselves as such, legally and socio-culturally, and that is what matters. They are of African descent but they are also French. In fact, Paul Pogba, speaking ahead of a the game said, amongst other things, that "we all feel French, we're all happy to wear this jersey". If Africa wants credit for winning the FIFA World Cup it should start investing in its young people, and, of course, their parents, so that they won't have to leave the continent - sometimes making perilous journeys across the Mediterranean sea - seeking refuge and opportunities elsewhere.